As much as we adore the delicious meals that come out of our dear old slow cooker, some days don’t allow for that lengthy cooking time, and sometimes it is our hunger that demands to be fed within an hour. When the belly starts to grumble and raise a ruckus, it is up to us to take matters into the kitchen, where we can begin to prepare a nutritious meal, with enough leftovers to lift us into the following day. Sure, bacon and eggs are a quick solution to an energy crisis, yet there are moments when we crave something more complex and full of homegrown flavor. In those moments of daydreaming about food, your body is yearning for a stew. Whether it be beef or lamb, listen to your gut instinct, or whatever is in your fridge, and get cooking! 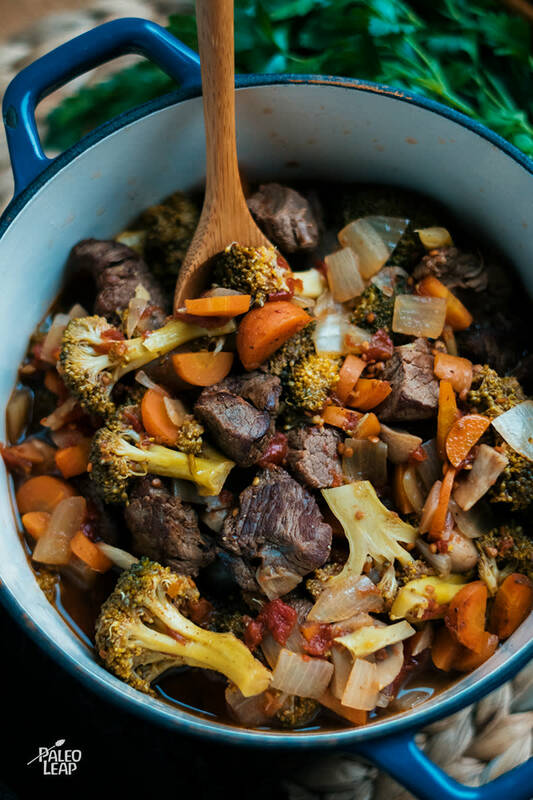 A simple stew is super easy to make: heat up your favorite saucepan, add your Paleo fat of choice, brown the cut-up meat and remove it from the pan, add onions, then garlic and the rest of the veggies, return the meat to the pot and simmer for 30-40 minutes. In about an hour, you will have a rich pot of wholesome goodness, that is just waiting to be shared. Sure beats ordering takeout! Take a break and read a book while you wait, or spend a few minutes chopping up some grape tomatoes and a small onion for an appetizer while those gorgeous smells fill the room. Heat a large saucepan over medium-high heat, and melt cooking fat. Brown the lamb pieces in the saucepan about 1 minute per side, then set aside. Add carrots, onions, garlic and cook for a couple minutes until the onions begin to soften. Add the mushrooms, broccoli, tomatoes, and pour in the beef stock, scrape the bottom of the saucepan while cooking. Sprinkle with fresh thyme, and season to taste. Bring the lamb back to the saucepan, lower heat to medium, cover, and cook 30 to 40 minutes.